AI, Blockchain, VR, IoT and other disruptive technologies need to be made part of curriculum in all the disciplines in the Higher Education. If not done, there will be a big gap between what universities offer and what recruiters want. 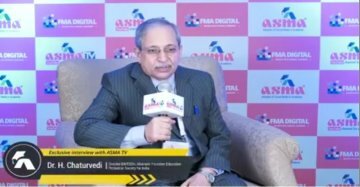 Dr H Chaturvedi (Director, BIMTECH; Alternate President, Education Promotion Society for India) in a chat with #ASMATV shares why higher education needs to incorporate disruptive technologies such as Artificial Intelligence (AI), Internet of Things (IoT), Blockchain, Virtual Reality (VR) in their curriculum, how universities and colleges and stay in terms with the changing times, how social media can transform education marketing and admissions marketing, how digital media can help with industry-academia connect and more. We are delighted to have Dr Chaturvedi as our Keynote Speaker at the 2nd ASMA Annual Convention & Awards 2018 at The Leela Palace, Bangalore on August 31-September 1, 2018., which saw enthusiastic participation from 200+ thought leaders, influencers and change agents from the Academia, Government and Technology space.